Franz Schausberger, University Professor of Modern History at the University of Salzburg and former Governor of Salzburg, was awarded the title “Doctor Honoris Causa” (DDr., Hc) on the 22nd of May 2018 by the state university “Aleksandër Moisiu” in Durres (Albania). 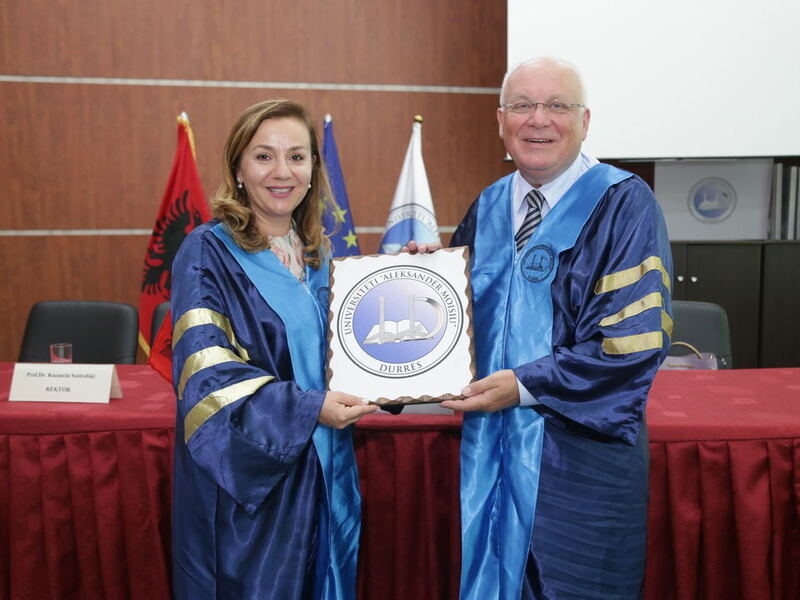 Schausberger Franz was awarded the title of honorary doctor “for his outstanding contribution to the European historical sciences and his scientific expertise for the integration of Albania and the other countries of the Western Balkans into the European Union”. The Rector of the University, Prof. Dr. Ksenela Sotirofski emphasised: “This honorary doctor award is due to Schausberger’s valuable contributions in the field of science and politics, especially in questions of European integration”. Prof. Dr. Franz Schausberger has been passionately committed to the integration of the Western Balkans into the European Union for many years. He has organized numerous conferences, seminars, meetings and panels, as well as published papers that have highlighted the problems and suggested possible solutions to speed up the EU integration of the Western Balkan countries. The application to the Academic Senate for the honorary doctorate for Prof. Schausberger was made by Prof. Enver Bytyci. The Dean of the Faculty of Law and Political Sciences, Prof. Dr. Andon Kume, who gave the eulogy, praised Prof. Schausberger’s work as a historian, scholar, and politician and above all, highlighted the many years of close collaboration between his Institute of the Regions of Europe and various universities and other scientific institutions in the Western Balkans. The award ceremony was attended by members of the Academic Senate, lecturers and students of the Aleksandër Moisiu University (UAMD), professors and scholars in the field of history and political science. Prof. Schausberger was pleased with the honor of being part of the UAMD family and expressed his willingness to promote the values of the University in Austria and beyond. He also entered Salzburg’s special relationship with the name of the university, the famous Austrian-Albanian actor Alexander Moissi, an Albanian descent, born in Trieste, spent part of his youth in Durres and played from the founding of the Salzburg Festival in 1920 for many years the “Jedermann”. “My special thanks go to the students attending this ceremony, and I pledge you that I continue working hard to bring you into the big European family as soon as possible”, Schausberger said.